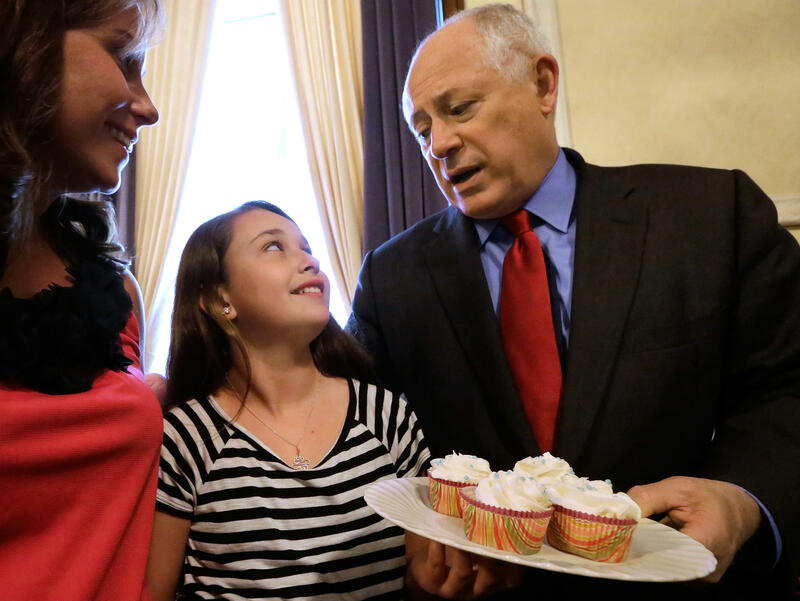 Chloe Stirling presents cupcakes to Illinois Gov. Pat Quinn in his office last month. Last week, the Illinois Legislature passed a "cupcake bill" that would overturn the health department's policy and allow amateur bakers to sell a limited amount of bread and pastries without a license. "Some of this stuff seems so stupid to me, that we have these rules," says Republican state Rep. Charlie Meier, who sponsored the bill. Dozens of county health departments argued against Meier's measure, but it passed both the state House and Senate unanimously. Democratic Gov. Pat Quinn is expected to sign it soon. Lawmakers in a number of states have become convinced that state and local agencies are sticking their noses into too many kinds of businesses. It's not just doctors and Realtors who need a license. Depending on the state, florists, tour guides, interior designers and cosmetologists might need one, too. Even some consumer groups are concerned that so much regulation does less to protect public health and safety than to dilute competition in the marketplace. "I'm not endorsing giving business a free pass, but regulators should be focused on consumer issues that affect a broad swath of the public," says Amit Narang, regulatory policy advocate for Public Citizen, a consumer organization. Back in the 1950s, only about 5 percent of Americans worked in jobs that required some form of state licensure. Today, that number is closer to 30 percent. Paring back on occupational licensing has become a pet cause for House Majority Leader Eric Cantor, who has called on governors to deregulate where it makes sense. The question of who gets regulated doesn't always seem to depend on safety and security. "Only five states license shampooers, for instance," writes Ramesh Ponnuru in Bloomberg View. "Presumably, that's not because shampooing is exceptionally dangerous in those states." Increased licensing requirements don't automatically translate into less risk, Narang says. With states and localities often stretched thin financially, they can't be an effective watchdog over every type of enterprise. "Having rules on the books doesn't necessarily mean that agencies are as focused on enforcing those rules and mandating compliance," Narang says. That's not to say he thinks regulating business isn't important. Few but the most libertarian would want to return to a time — say, a century ago — when government oversight was light to nonexistent and industrial accidents such as the Triangle Shirtwaist Factory fire and sales of tainted meat and drugs were far more common. Governments want to keep an eye not only on industries that can affect life and limb, but on enterprises where major consumer dollars are at stake, such as car dealers and home contractors. "There really is a justification for using those requirements as a means to make sure that somebody knows what they're doing when they want to engage in a profession," says Susan Grant, director of consumer protection at the Consumer Federation of America, "and also locating them when there are problems." But regulation and licensing — which can require extensive training and certification — can lead to higher prices for consumers. The push for new regulation sometimes comes not from consumers who complain to policymakers when they feel they've been ripped off or put at risk, but rather from existing firms that want to make it more difficult for competitors to set up shop. "The first thing that comes out of regulators' mouths is, 'It's never consumers who ask us to regulate; it's always people in the industry,' " says Katelynn McBride, an attorney for the Institute for Justice, which advocates for less regulation. "New entrants are coming into the market, and they need to be shielded from competition." When it comes to baked goods, state officials recognize that there's relatively little health risk, compared with meat or raw foods. But the amount of so-called cottage foods they'll allow individuals to sell without a license varies tremendously — from $5,000 a year in Minnesota to 10 times that amount in Texas and California. The Illinois bill allows unlicensed bakers to bring in as much as $1,000 a month as long as they warn customers their kitchens haven't been inspected. The legislation bars local governments from further regulation unless there's an outbreak of foodborne illness. Meier, the Illinois state representative, says amateur bakers should be able to see a small profit in order to test the market and see if they might be able to make a more serious go of it before bearing the costs of setting up a commercial kitchen. "In Chloe's situation, if she goes on like this, she probably will open a bakery," Meier says. She's well on her way. The cupcake bill brought her national attention, including an appearance on Rachael Ray's Food Network show, and local merchants have donated a commercial oven and built an extension for it onto her house.